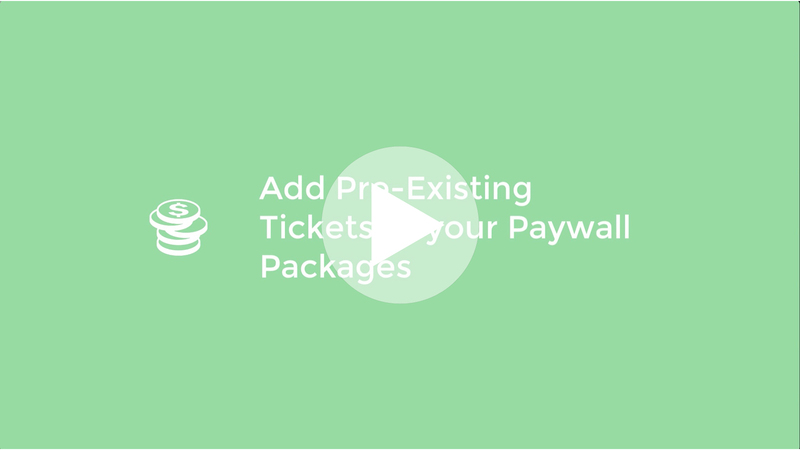 If you have already created a Paywall Package with Tickets and create a New Paywall you will see a section on the right configuration pane called Existing PPV Tickets. Here you are able to add Tickets you have already created previously to your new Paywall. If you want to check out some Pay-Per-View Demos and extra information please visit our Pay-Per-View information page. Please bare in mind that if you have created Ticket 1, Ticket 2 and Ticket 3 in Paywall 1. Then re-use Ticket 1 in Paywall 2. All videos that have Paywall 2 applied to will be accessible for the buyer no matter if they purchased the ticket in Paywall 1 or Paywall 2. Also if you make any changes in the re-used Ticket 1 within Paywall 2, All changes will also be applied to Ticket 1 within Paywall 1. To add an existing Tickets create a new Paywall. Now with the new Paywall created select the Existing PPV Tickets section from right hand configuration pane. With the Existing PPV Tickets expanded you will see any previously created Tickets. Simply click on your desired ticket to add it to the current Paywall. To save your Tickets and Paywall simply click on the green ✅ Save button below.